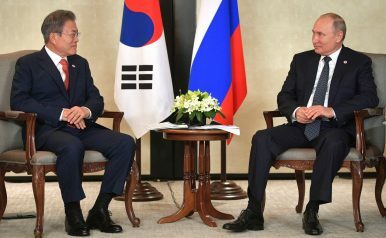 Almost immediately after taking office in a challenging time of tensions with North Korea in 2017, President Moon Jae-in set out one of the most important objectives of state policy: elevating ties with Russia and strengthening bilateral economic cooperation through so-called New Northern Policy. According to South Korean government’s 100 Policy Tasks Five-Year Plan, the New Northern Policy, as well as the companion New Southern Policy, is a part of the Northeast Asia Plus Community of Responsibility project, which aims to build a sustainable regional system of cooperation with ASEAN, the “middle power” grouping of MIKTA (Mexico, Indonesia, South Korea, Turkey, and Argentina), India and Northeast Asian states. In June, 2017, Moon established the Presidential Committee on Northern Economic Cooperation, and then appointed Song Young-gil (previously the special envoy to Russia and famous for his contribution to the development of Russian–South Korean relations, for which he was awarded the Russia’s Order of Friendship) as a head of the Committee in August. In his keynote speech at Eastern Economic Forum in Vladivostok in September 2017, Moon broadened the concept of the New Northern Policy with the “Nine Bridges” initiative, setting up a number of areas of cooperation between the two countries (the “bridges” here a metaphorical). The interesting thing about Nine Bridges is that it’s not only a political declaration but a quite definite economic cooperation program, focusing on specific projects. In this regard it is especially relevant to estimate the fruitfulness of these projects, since they appear to be both a major pillar for and proof of the viability of the Russian vector in current South Korean foreign policy. One of the most forward-looking directions of the initiative is the “gas bridge.” Although the natural gas trade is a traditional field of cooperation between two states, Russia is not among the top gas exporters to South Korea. Seoul thus seeks to diversify its gas import channels by purchasing more LNG from Russia. The plan is to increase the supplies of Russian LNG, which are currently on the level of 1.5 million tonnes per year, according to a 2005 agreement between KOGAS and Sakhalin Energy, operating company of Sakhalin-1 and Sakhalin-2 gas development projects. Taking into account the discord between KOGAS and Australia’s North West Shelf Gas, followed by an arbitration proceeding, South Korea may turn to Russian LNG exporters. Buying LNG from Russian partners is profitable in terms of location advantages; however, it is far from likely that Russia will prove able to crowd out its main competitors in the Korean market – Australia, Malaysia, and the United States. The second direction of the “gas bridge” is related to the construction of a gas pipeline from Russia to South Korea via the territory of North Korea. This project can be implemented through the connection of a trans-Korean gas pipeline (with a total length of 11,00 km) to the endpoint of the Sakhalin-Khabarovsk-Vladivostok gas transmission system. The cost of pipeline laying would be about $2.5 billion, and Gazprom has repeatedly stated that such work could be done quickly and easily, if it weren’t for political obstacles, namely the sanctions regime against North Korea. Another significant “bridge” is a trilateral railroad project, by which is meant reconstruction of the Trans-Korean Railway and its connection to the Trans-Siberian Railway. This would require huge investment, but the first steps are already being taken by South Korea, which is now actively conducting research on North Korean railroads’ condition and consulting with Russia (a Korail office in Moscow was opened at the end of 2018). But while the construction of the railway appears to be a long-term project, Seoul has also a short-term objective: to rejoin the Rajin-Khasan logistics project. South Korea, which used to be an investor and recipient of the service in this joint venture until 2016, can now resume its participation in it. Since Rajin-Khasan is exempt from the UN sanctions list, it is only a question of Seoul’s political will to do so. South Korea is also interested in the modernization of ports in Russia’s Maritime Province, notably the port of Zarubino. South Korean companies are currently participating in the construction of port terminals in Slavyanka and Fokino, which is very important for the development of Primorye-1 and Primorye-2 International Transport Corridors. The maritime segments of these ITCs are of key interest to South Korea, and DBS Cruise Ferry transport operator conducted a cargo transshipment in Zarubino as part of a test voyage from Sakaiminato to Changchun twice in 2018. However, given that South Korea is facing a conflict of interest with China, which is also planning an infrastructure investment in Zarubino, it can be said that Seoul has more prospects with regard to Slavyanka, for which the feasibility study carried out by the Ministry of Oceans and Fisheries is expected to be completed in 2019. The aim of the next “bridge of cooperation” is the development of the Arctic Shipping Route in order to create a new logistics corridor in the Arctic Ocean. Regrettably, one must conclude that this doesn’t relate to the infrastructural development of ports in Arctic region; instead South Korea is emphasizing shipbuilding and ship maintenance, which could also be attributed to the separate “shipbuilding bridge.” South Korea’s DSME shipbuilding company has a contract for the construction of 15 Arc7 ice-class gas tankers for the needs of Russia’s Yamal LNG gas processing project, and four of them are already introduced and provide transportation services through Arctic Shipping Route. In other respects, though, bilateral shipbuilding cooperation faces a number of problems. South Korean shipbuilders have to withstand emerging competition from Russia’s Zvezda shipyard, which got a contract for the construction of 15 tankers for Arctic LNG-2, another Russian gas project. Given the recession of the steel and shipbuilding industries in South Korea, cooperation between Korean and Russian shipbuilders remain limited. For instance, in early December 2018 it was announced that Zvezda would buy some parts of an Aframax tanker’s hull produced by Hyundai Samho Heavy Industries in order to complete the construction domestically. Zvezda isn’t yet ready to build the tankers independently, but ordering the entire ship is apparently not a preferable option for Russia. The fisheries industry is one more forward-looking field of cooperation. Initially, Korea Trading & Industries announced the plan to invest $130 million in the construction of a fish processing complex at Cape Nazimova in Vladivostok, which will include a logistic center, fish port, container terminal, and fish fillet and crab meat processing plant. The South Korean company found a partner from the Russian side, but local authorities are reluctant to grant permission to allocate land for the complex. According to Acting Governor of Maritime Province Andrey Tarasenko, Russia was ready to provide an area in Rakushka Bay in Olginsky District, but the question still remains whether the South Korean company is inclined to agree to that. Another problem is the necessity to upgrade the fishing fleet: Russia needs to build a large number of fishing vessels, and that is an additional issue to be taken into consideration by both parties. The plan for the “agricultural bridge” proposes the construction of mineral fertilizer plant in Kozmino, close to Nakhodka, which is expected to be introduced by 2022. The building cost is estimated at $6 billion, and the plant will focus on the production of methanol fertilizers. It was settled that Hyundai group will become main investor for the project, and since the production costs are expected to be low with 1.8 million tonnes of fertilizer output per year, the project will be undoubtedly beneficial for both sides. And lastly, the program of Nine Bridges includes the construction of the industrial complex in Maritime Province. This task is quite broadly formulated and abstract; it commonly refers to the idea of a Kaesong-like industrial complex, which would involve Russian land, North Korean labor, and South Korean investments. However, the prospects for such a partnership are sufficiently obscure as long as the sanctions against North Korea – the main barrier for trilateral projects – are still in effect. Russia and South Korea have indeed developed a common ground, and bilateral cooperation can certainly be expected to be fruitful. Even though Russia is hardly able to become South Korea’s key partner, it is essentially important for Seoul to elevate ties with Russia in terms of trade and diplomatic diversification. But nevertheless, there are a bunch of problems that affect economic cooperation, which include both internal and external difficulties. The latter ones involve numerous conflicts of interest (emerging competition between Rajin and ports in Maritime Province, the trans-Korean gas pipeline project and Russia’s LNG supplies to South Korea, shipbuilding industries in Russia and South Korea) and examples of failed deals (the sale of Hyundai’s idle factory near Vladivostok, the DSME’s withdrawal from an investment agreement with Zvezda shipyard). Beyond that, the problem of sanctions still persists – not only are sanctions against North Korea affecting any form of trilateral cooperation, but there are also the EU and U.S. sanctions imposed on Russian companies and businessmen, which make South Korean investors reluctant to make deals with Russia. Valentin Voloshchak is a teaching assistant at Far Eastern Federal University’s Department of International Relations.